State hunting ground – game breeding site no. IV/15 – “Draganić” was founded in 2010. Before that hunting ground was managed by the company Ribarski Centar Ltd. which ended its business operations when it went bankrupted in November 2007. Today the hunting ground is managed by a concessionaire, the company called Fish farm Kupa Ltd., Mrzljaki 108, 47201 Draganići. The breeding site is located in the north part of the Karlovac County, Municipality of Draganić with the registered office in the town Mrzljaki. It is a part of a wider area of Pokupski bazen in which there are several similar breeding sites-fish farms. It is located in the triangle area of the Zagreb-Karlovac motorway and the Kupa-Kupa Canal. The breeding site is surrounded by natural forest ecosystem from the north, west and east side, which is the area of the state forest G.J. Draganički lugovi, managed by the Draganići Forestry Office (Šumarija Draganići), and the A1 motorway from the west side. The game breeding site is lowland with the total surface of 424 ha, 375 ha of which are covered in water. In the “Draganić hunting ground” a significant surface is occupied by canals covered with reed, which makes it an ideal habitat for feathered game, particularly marsh birds. Owing to that, we have a rich population of mallards and coots. State hunting ground – game breeding site is technically well-equipped, within the hunting-ground there is an administrative building and the facility with 6 apartments designed for hunters. Dinghies for the activities on the fish farm, transport of the hunters to shelters and the regularly mowed banks that are being used as roads are provided. The mallard or wild duck is the most common and the most widespread European web-footed duck, and also the largest and the heaviest. It is about 58 cm long, weighs 850 – 1,400 grams and has a wingspan of about 90 cm. The male and the female differ; the male has distinguishable green-blue head and neck. It inhabits ponds, lakes, rivers, canals, park ponds etc. It is not overly timid so it often approaches humans. It feeds on aquatic vegetation and different water animals, fish and frogs. 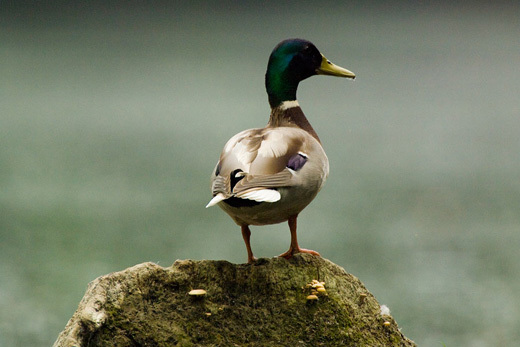 The life expectancy of a mallard duck is 5 to 15 years. The mallard chooses various breeding surfaces, but in hidden places. It lays 9 -13 eggs, and the female stays with the ducklings. The males join a flock before the summer moulting. The female has a loud cackling call, and the male makes a silent “wepp”. In flight, it is recognisable by its size, firm body, slightly round-shaped wings and medium fast wafts. It makes a characteristic wing whistle in flight. The mallard is our non-migratory bird, but in winter it looks for places with sufficient food supply. Duck-hunting, usually at mallards, is very popular, especially among the Italian hunters. The ducks are hunted during overflight, before and after sunset, when leaving waters and flying towards the inland looking for food. Considering the flight height, stronger chokes and bigger calibres are used (3.0 – 3.5 mm), with the maximal shooting distance of 40 m. Duck-hunting is permitted in the period from 1st September until 31st January. The order Gruiformes includes the bird families Cranes (Gruidae) and Bustards (Otididae) which come to these areas as migratory birds, but are permanently protected. The order Gruiformes also includes the family Rails (Rallidae) whose body is adapted to life in water, but is not web-footed. The Eurasian coot, or simply the coot inhabits our region; it lives near lakes and wetlands of greater surfaces. It is black, with a characteristic white facial shield. It is a migratory bird. It nests in May. Its nest is made of reed and is often a floating raft. It lays 12 eggs, and broods them for 21 days. It feeds on aquatic vegetation, worms, maggots, snails and smaller fish. Its meat smells of fish. The coot is a good swimmer and diver, but a bad flyer. When wounded, it dives, catches a root or an aquatic plant and dies that way, without surfacing. 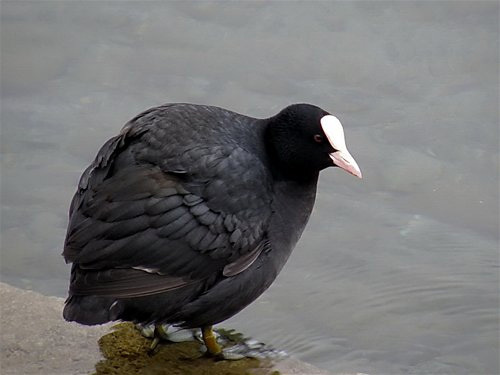 The Eurasian coots are numerous inhabitants in waters that are rich in vegetation as ponds, old backwaters and other wetlands. However, these birds have many enemies. They are usually prayed by different types of vultures, as the black kite. The marsh harrier steels eggs because in springtime it feeds on eggs of different species of marsh birds. Because of that the coots have big nests often with more than 10 eggs. Killed game will be charged according to this price list. A confirmation is issued for killed game. Wounded game that has not been found will be charged 50% of the trophy value estimated by a professional companion and 50% of the game value of average weight of that species from a hunting-ground where the game has been shot, provided that the dog tested on the blood trail had been used in the search. If the wounded game is found, the hunter will pay the difference in price up to the actual price of the killed game. Value Added Tax (VAT) is charged to all prices. Hunting and other hunting services will be charged after the hunt in the hunting -ground in cash or by check if not otherwise stipulated by the contract prior to hunting. Apartments “Kormorani & co.” can be rented for a weekend with prior notice. There are 6 apartments which can be rented for the price of EUR 100 per day, breakfast included.